April, 2018 | Temuka Golf Club Inc. The course will be open for play tomorrow. The course is closed due to conditions on course. Hammer Hardware stableford transferred to 12th May. Club Championship finals transferred to 13th May. Front 9: JJB (PL Pt) 44, ACA (Tka) 43 pts. Mens stableford: Gross: M Reilly 48 pts Medal: W Bell 51-20-31, J Tarrant 49-17-32 on C/B. Stableford: F Ledington 21, M Reed 19. Stableford: J Whitley 35 pts, J Davenport 33, N Donoghue 31, K Manson 31, R Jones 31. A Phillips 14 putts, L Reilly 16, M Kerse 16, C Spillane 17, M Jackson 17, A Courname 17. Nearest the Pin: R Stevenson (No 9 & 12) Nett Eagles : Jackpots. Thirteen mixed pairs entered the Green Family Trophy on Sunday 25 March 2018. 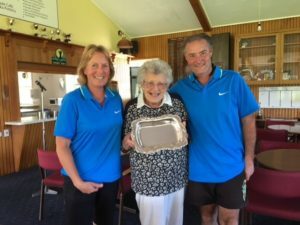 The winners were Sharon and Daryl Patrick with a combined stableford score of 70 points. 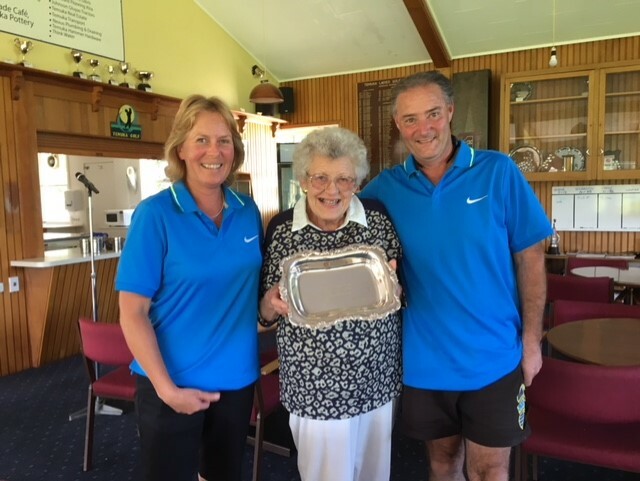 Bev Green came along, on behalf of the Green family and presented the silver tray to the winners. Thanks to all who continue to support the various trophy events which are organized by your Social Club. Photo shows Sharon, Bev Green and Daryl.